While problem solving a fork issue on the 1940’s/50’s Mercier Meca Dural that I have been restoring, I thought about changing its headset so that I could mount a different fork with a slightly shorter steerer tube. That effort was, sadly, unsuccessful. But in the process, I had to compare various French headsets that I had on hand to determine which one might solve the problem of needing a slightly shorter stack height. One of the headsets in my bin was a 1950’s Stronglight Competition headset. The rest of the French headsets I had one hand were 1970’s French headsets – probably all of which were made by Stronglight, but which are unbranded. When I began comparing this older headset to the (relatively) newer ones, I was amazed at the difference in quality. The cups and races are beautifully machined, and are of much higher quality than the their 1970’s counterparts, shown below. The photos don’t quite do justice to the quality differential. But, if you hold these cups and races in your hands and look at them with bare eyes, the difference is clear. 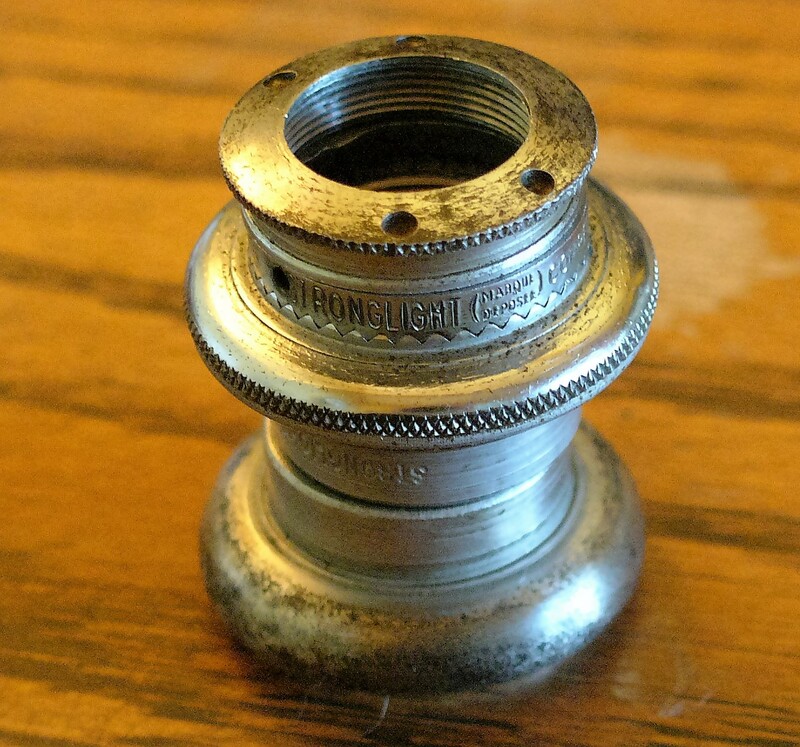 According to this helpful post from Classic Lightweights, the 1950’s Competition headset is made from hardened chrome nickel steel, and feature V shaped races which provide for more bearing contact (thanks to Jim at Bertin Classic Bicycles for clarifying this important distinction). The newer 1970’s versions are made from lower grade steel, and have U shaped bearing races. The nice branding on all of the pieces really motivated me to try to make this headset work on my restoration project. The original fork was seriously compromised with rusting and pitting on the fork blades. 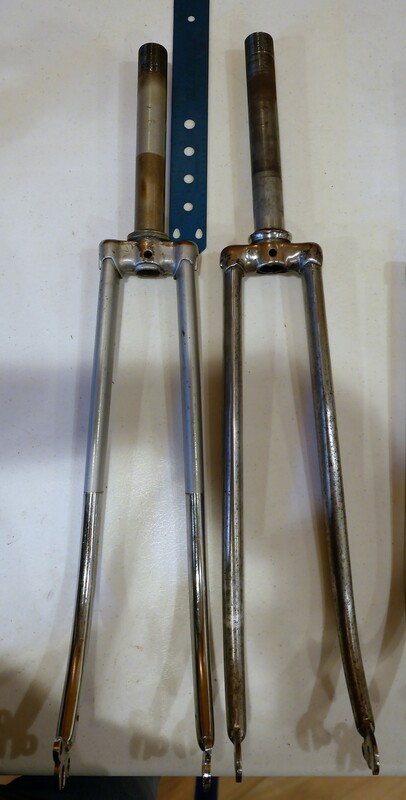 I had sanded off the pitting and have been searching for the right solution which would result in either an original newly chromed fork, or an original newly painted fork. I was not able to find any painter or chrome-plater in the Portland region that I wanted to trust with this vintage fork. So, I looked around at the forks I had on hand. One of them was a 1970’s fork from a silver Peugeot. The steerer tube was shorter than the original fork by about 5 mm. Drinking some Kool-Aid, I decided that maybe I could make this work, after all, the fork looked perfect with the Meca Dural aluminum frame, as you can see from the above photo. 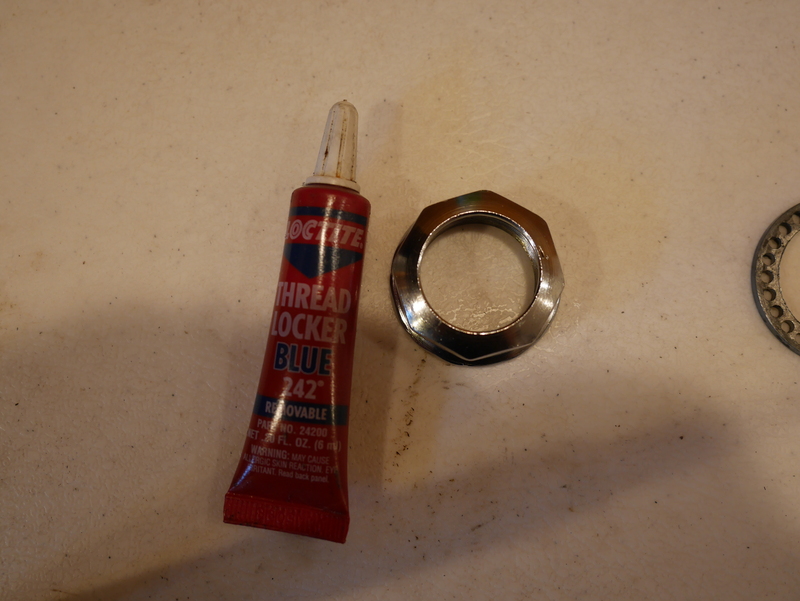 After doing a bit of research, I determined that I could eliminate the lock washer and instead apply some Locktite to the steerer threads. That would save about 2 or 3 mm. But, to make this work I needed to Dremel off the pin on the top of the 1970’s headset that I originally envisioned as my solution to the problem. Okay, that was easy. Unfortunately, when I dry mounted the fork into the headtube, I forgot about the space that the 5/32 inch bearings would need. So, I ended up with only 2 or 3 threads showing on the steerer tube above the upper cup, after installing the bearings. That’s not enough. 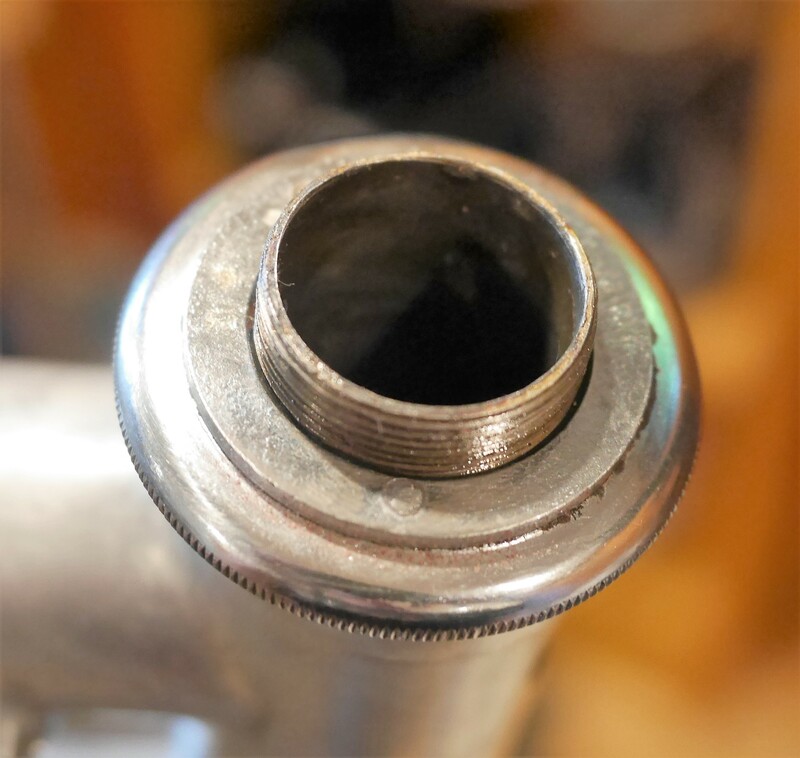 You really need at least 5 or 6 threads showing in order to feel confident that the steerer tube will stay in adjustment, especially if you are going to remove the lock washer. So, it’s back to the drawing board with the fork. I either need to find an appropriate replacement fork, or the right company to chrome-plate or paint the original fork so that the bike can be restored to its original glory. 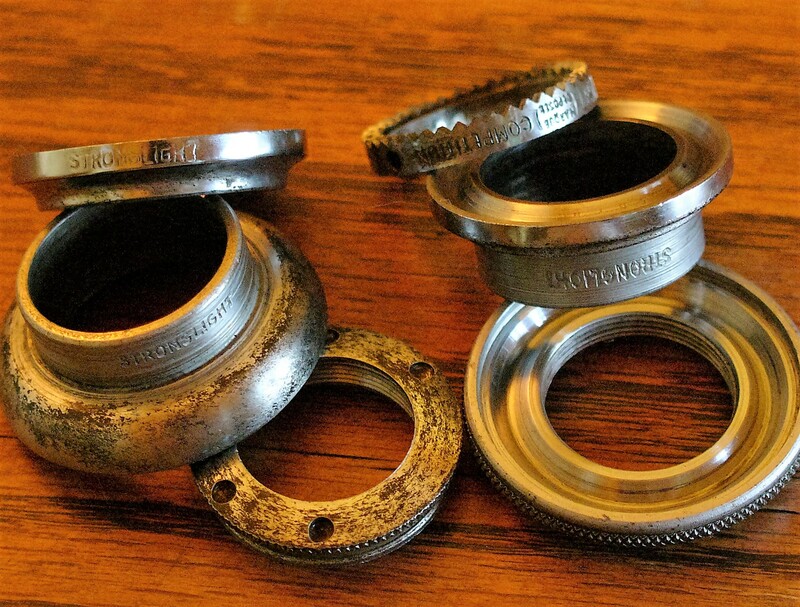 But, the 1950’s Stronglight Competition headset gives further evidence to the quality of vintage cycling components as compared to their modern day counterparts. This entry was posted in Bicycle restoration, French bicycle, Meca Dural, Mercier, Mixte, Peugeot bicycle, Vintage bicycle, Vintage bicycle restoration, Vintage French Bicycle and tagged French headset, Meca Dural, Mercier, Stronglight, Stronglight competition headset, vintage headset by Nola Wilken. Bookmark the permalink. The image is a little lost with photography but I can see what you mean about the comparison of the two headsets. The 50’s Stronglight has such wonderful attention to detail. Plus, the inside of the cups just look better. You are wise to continue pushing forward with its install. I believe the Mercier fork has potential. I do have some folks, more vested than I in restoration, who may know of a chrome-plater here in Portland. Say the word and I will inquire more and contact you offline. Hi Josh, thanks for the encouragement on the chrome-plating/painting front. I may even think about clear coating the vintage fork for now so that I can continue with the build. In the meantime, I will contact you via email for your referrals. My own favorite builder no longer uses anyone in Pdx for frame painting. Some of the old components were very good indeed. I salvaged a Competition V4 headset like yours off of a beater 1970s PX 10. I cleaned it up and installed it on the restoration I was doing as a direct replacement for the Bertin’s OEM Stronglight V4. It went together perfectly (I had the upper and lower headtube faced previously as V4s are very sensitive to out off parallel race installation). The quality of the V4 machining was exceptional and the V shaped cup profile doubles the contact points for the bearings. The races seem very hard as well and, as built, the headset is extremely free running and smooth. The disadvantage of all this excellence and robustness is that the V4 has the weight to match. The later headsets are built down to a price with their U shaped and pressed bearing races. 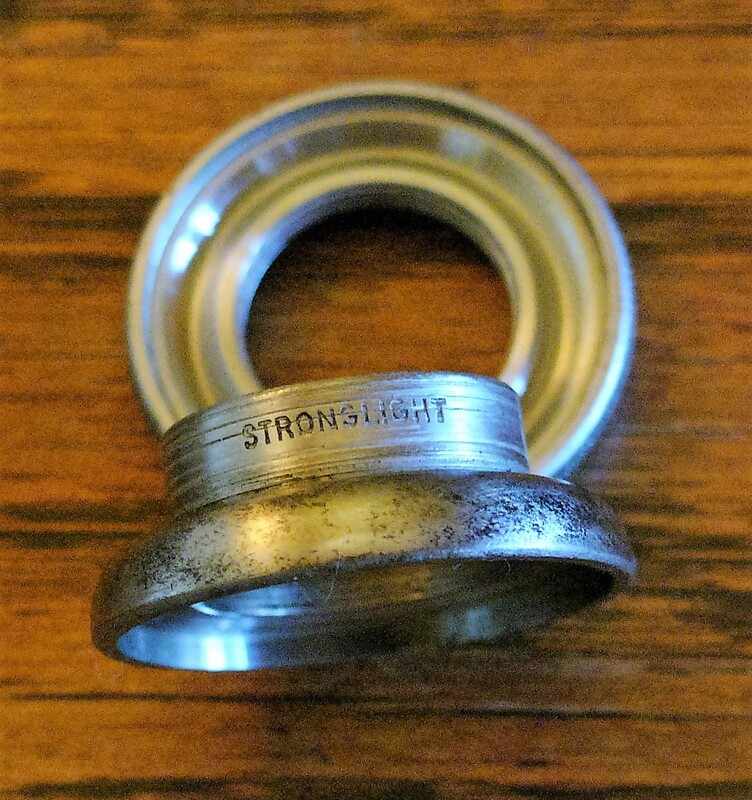 You might want to try a Stronglight P3 headset for your restoration as it has a 5 mm lower stack height and may provide you enough threads. No lovely V races though. Good luck. Thanks, Jim. Your advice on the Stronglight P3 is very helpful. I may look around for one and see if I can make the newer fork work. Interesting comment about the different shaped races – I hadn’t clued into the V shape on the Competition’s races and how they would improve the contact points for the bearings. Thank you! Any recent news on the Mercier build, Nola?